Thomas Zentall is a professor of psychology at the University of Kentucky. Tom's research interests focus on cognitive behaviours in animals including memory strategies, concept learning, and social learning. 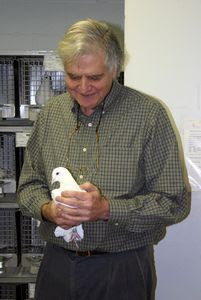 The approach Tom and his students use is to define a cognitive behaviour that is characteristic of humans in a way that clearly distinguishes it from simple associative (SR) learning and then to examine the conditions under which it can be found in animals. This approach not only examines the relatively unexplored repertoire of animal behaviour that has been thought to distinguish humans from other animals, but it also develops relatively simple training techniques that may be useful in training developmentally delayed and learning disabled humans to use concepts and strategies. Tom has contributed a great deal to the field of comparative cognition, so much so that the Comparative Cognitiion Society had him give the master lecture at CO3 in 2014.